, a very learned English divine aud critic, descended from a family of that name at Gatacre-hall, in Shropshire, was born Sept. 4j 1574, in the parsonage-house of St. Edmund the King, in Lombardstreet, London, where his father, an eminent Puritan divine (who died in 1593) was then minister. At sixteen years of age he was sent to St. John’s college in Cambridge; where, in due time, he took both the degrees in arts. 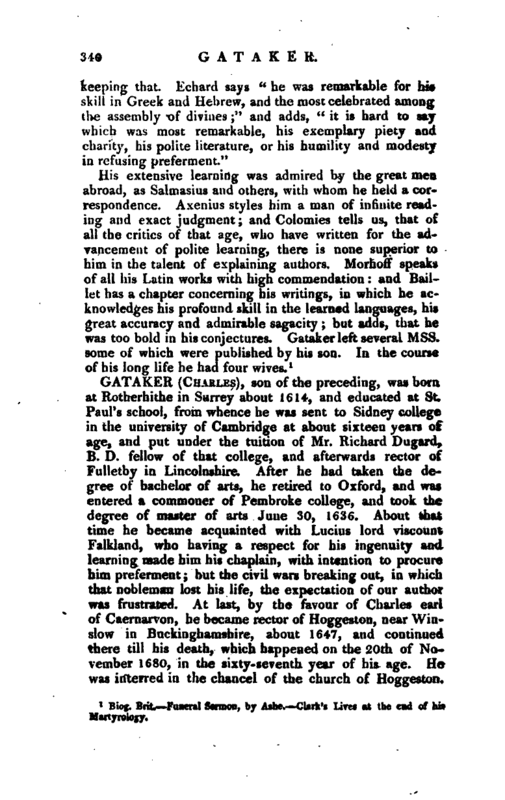 He was greatly distinguished by his abilities, learning, and piety; insomuch that the foundation of Sidney college being laid about this time, he was, by archbishop Whitgift, and Dr. Goodman dean of Westminster, the trustees of | that foundation, appointed a fellow of that society, even before the building was finished. In the mean while he went into Essex, as tutor to the eldest son of Mr. (afterwards sir) William Ayloff, of Berksted, who himself learned Hebrew of him at the same time. During his residence here, he usually expounded a portion of scripture to the family every morning; in this task, after rendering the text into English from the original language, he explained the sense of it, and concluded with some useful observations. In the space of two years he went through all the prophets in the Old Testament, and all the apostolical epistles in the New. 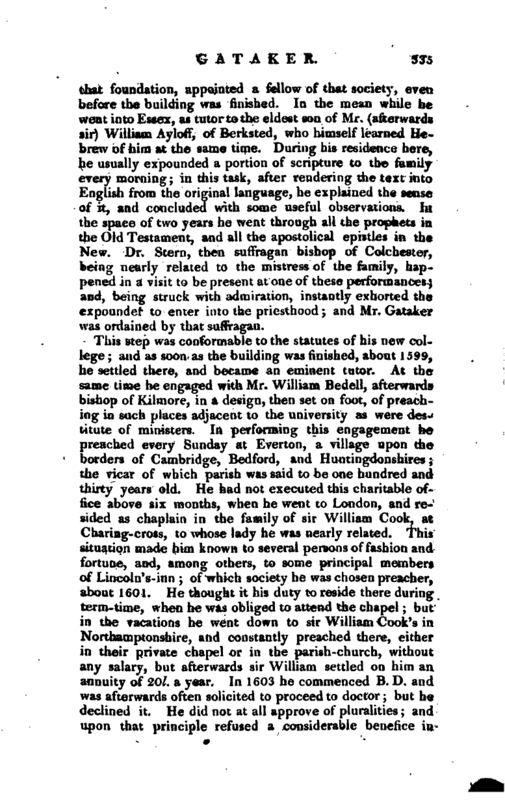 Dr. Stern, then suffragan bishop of Colchester, being nearly related to the mistress of the family, happened in a visit to be present at one of these performances; and, being struck with admiration, instantly exhorted the expounder to enter into the priesthood; and Mr. Gataker was ordained by that suffragan. This step was conformable to the statutes of his new college; and as soon as the building was finished, about 1599, he settled there, and became an eminent tutor. At the same time he engaged with Mr. William Bedell, afterwards bishop of Kilmore, in a design, then set on foot, of preaching in such places adjacent to the university as were destitute of ministers. In performing this engagement he preached every Sunday at Everton, a village upon the borders of Cambridge, Bedford, and Huntingdonshires; the vicar of which parish was said to be one hundred and thirty years old. He had not executed this charitable office above six months, when he went to London, and resided as chaplain in the family of sir William Cook, at Charing-cross, to whose lady he was nearly related. This situation made him known to several persons of fashion and fortune, and, among others, to some principal members of Lincoln’s-inn; of which society he was chosen preacher, about 1601. 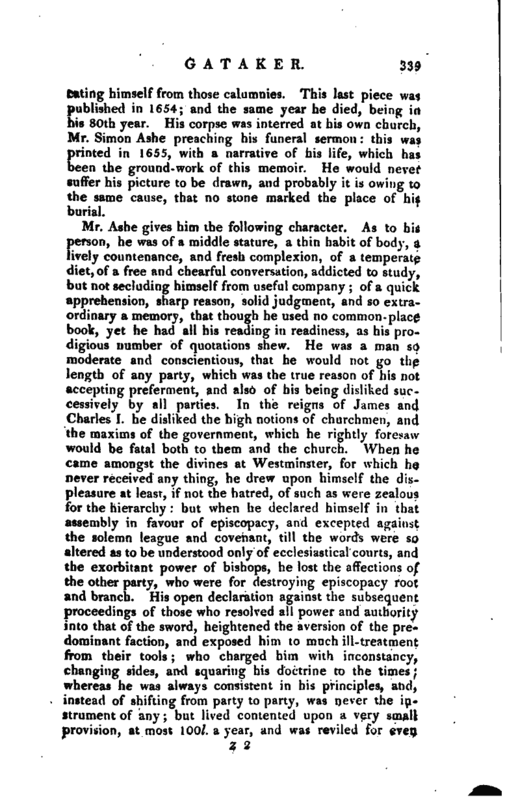 He thought it his duty to reside there during term-time, when he was obliged to attend the chapel; but in the vacations he went down to sir William Cook’s in Northamptonshire, and constantly preached there, either in their private chapel or in the parish-church, without any salary, but afterwards sir William settled on him an annuity of 20l. a year. In 1603 he commenced B. D. and was afterwards often solicited to proceed to doctor; but he declined it. He did not at all approve of pluralities; and upon that principle refused a considerable benefice in | Kent, which was offered him by sir William Sedley, while he held the preachership at Lincoln’s-inn. Having married in 1611, he quitted that place for the rectory of Rotherhithe in Surrey: yet yielded to the acceptance of this living, only in the view of keeping it out of the hands of a very unworthy person. In 1616 and 1617, he wrote two letters to archbishop Usher, concerning some curious Mss. of the famous Robert Grosthead, bishop of Lincoln, and others. It is true, that some mistakes in those letters are corrected by his correspondent, who, however, thought the whole very worthy of his notice; and they are mentioned here chiefly, as they shew at once his own modesty and erudition, as well as the esteem which Usher had for him. All this, however, he possessed in private, his modesty being yet unconquerable by any solicitations to commit any thing to the press; but this backwardness was at length subdued. 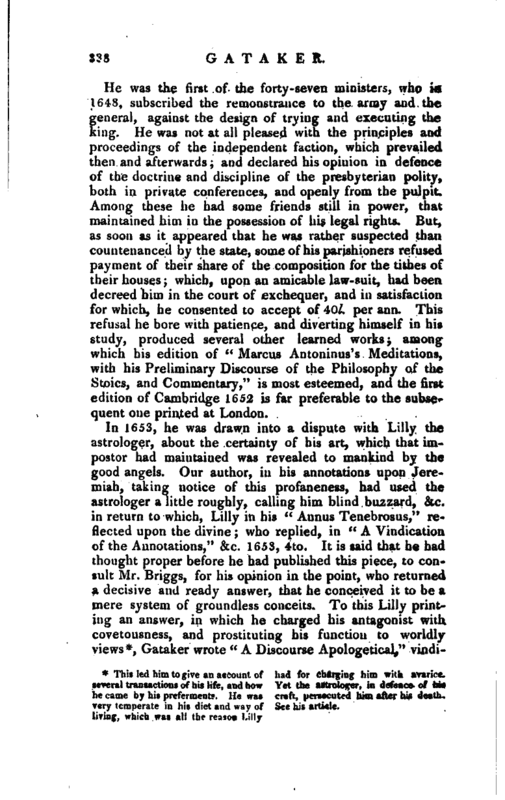 He had, in some of his discourses at Lincoln’s-inn, delivered his opinion concerning lots and lotteries, and shewn the lawfulness of the lusorious, and the unlawfulness of divinatory lots which being misrepresented, he published “A Discourse of the nature and use of Lots; a treatise historical and theological, 1619,” 4to. 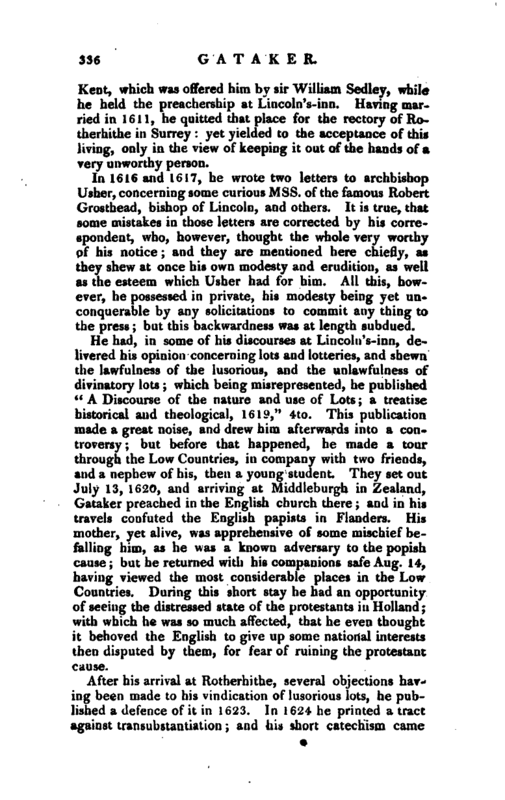 This publication made a great noise, and drew him afterwards into a controversy; but before that happened, he made a tour through the Low Countries, in company with two friends, and a nephew of his, then a young student. They set out July 13, 1620, and arriving at Middleburgh in Zealand, Gataker preached in the English church there; and in his travels confuted the English papists in Flanders. His mother, yet aliv-^, was apprehensive of some mischief befalling him, as he was a known adversary to the popish cause; but he returned with his companions safe Aug. 14, having viewed the most considerable places in the Low Countries. During this short stay he had an opportunity of seeing the distressed state of the protestants in Holland; with which he was so much affected, that he even thought it behoved the English to give up some national interests then disputed by them, for fear of ruining the protestant cause. After his arrival at Rotherhithe, several objections having been made to his vindication of lusorious lots, he published a defence of it in 1623. In 1624 he printed a tract against transubstantiation; and his short catechism came | out the same year. In 1640, and the following years, he engaged in the controversy concerning justification; and being appointed one of the assembly of divines who met at Westminster, he gave his attendance there, and among other conferences supported his opinion upon the lastmentioned article; but the point being determined by the majority against his sense, he submitted, and subscribed the covenant also, though he declared his opinion in favour of episcopacy. He engaged likewise with the assembly in writing annotations upon the Bible; and the books of Isaiah, Jeremiah, and the Lamentations, fell to his share, which, in the opinion of Calamy, are exceeded by no commentator, ancient or modern, on those books. 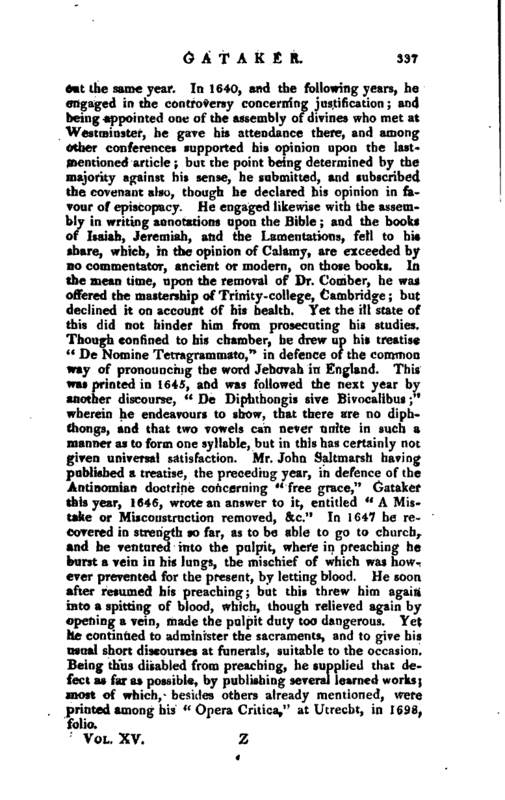 In the mean time, upon the removal of Dr. Comber, he was offered the mastership of Trinity-college, Cambridge; but declined it on account of his health. Yet the ill state of this did not hinder him from prosecuting his studies. Though confined to his chamber, he drew up his treatise “De Nomine Tetraqrammato,” in defence of the common way of pronouncing the word Jehovah in England. Tin’s was printed in 1645, and was followed the next year by another discourse, “De Diphthongis sive Bivocalibus;” wherein he endeavours to show, that there are no diphthongs, and that two vowels can never unite in such a manner as to form one syllable/^but in this has certainly not given universal satisfaction. Mr. John Saltmarsh having /published a treatise, the preceding year, in defence of the Antinomian doctrine concerning “free grace,” Gataker this year, 1646, wrote an answer to it, entitled “A Mistake or Misconstruction removed, &c.” In 1647 he recovered in strength so far, as to be able to go to church, and he ventured into the pulpit, where in preaching he burst a vein in his lungs, the mischief of which was however prevented for the present, by letting blood. He soon after resumed his preaching; but this threw him again into a spitting of blood, which, though relieved again by opening a vein, made the pulpit duty too dangerous. Yet he continued to administer the sacraments, and to give his usual short discourses at funerals, suitable to the occasion. Being thus disabled from preaching, he supplied that defect as far as possible, by publishing several learned works; most of which, besides others already mentioned, were printed among his “Opera Critica,” at Utrecht, in 169$, folio. | He was the first of the forty-seven ministers, who in 1648, subscribed the remonstrance to the army and the general, against the design of trying and executing the king. He was not at all pleased with the principles and proceedings of the independent faction, which prevailed then and afterwards; and declared his opinion in defence of the doctrine and discipline of the presbyterian polity, both in private conferences, and openly from the pulpit. Among these he had some friends still in power, that maintained him in the possession of his legal rights. 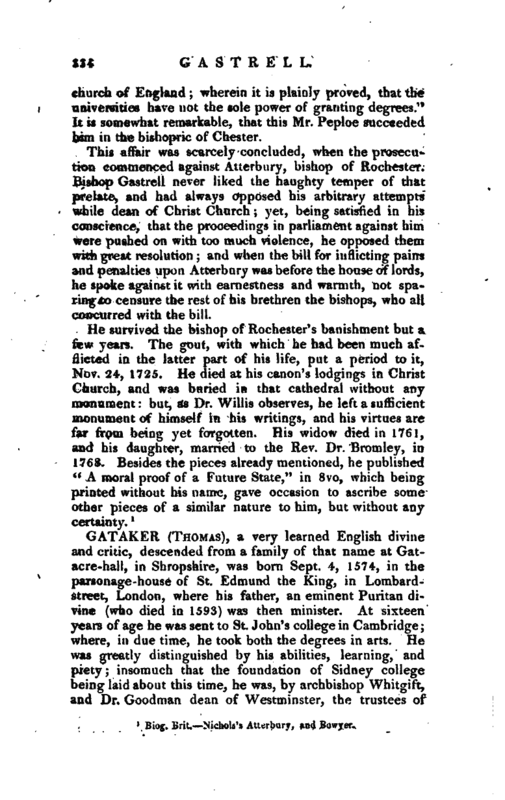 But, as soon as it appeared that he was rather suspected than countenanced by the state, some of his parishioners refused payment of their share of the composition for the tithes of their houses; which, upon an amicable law-suit, had been decreed him in the court of exchequer, and in satisfaction for which, he consented to accept of 40l. per ann. This refusal he bore with patience, and diverting himself in his study, produced several other learned works; among which his edition of “Marcus Antoninus’s Meditations, with his Preliminary Discourse of the Philosophy of the Stoics, and Commentary,” is most esteemed, and the first edition of Cambridge 1652 is far preferable to the subsequent one printed at London. This led him to give an account of several transactions of his life, and how he came by his preferments. He was very temperate in his diet and way of living, which was all the reason Lilly had for charging him with avarice. Yet the astrologer, in defence of his craft, persecuted him after his death. See his article. Gataker wrote “A Discourse Apologetical,” | vindiCiating himself from those calumnies. This last piece was published in 1654; and the same year he died, being in his 80th year. His corpse was interred at his own church, Mr. Simon Ashe preaching his funeral sermon: this was printed in 1655, with a narrative of his life, which has been the ground-work of this memoir. He would never suffer his picture to be drawn, and probably it is Owing to the same cause, that no stone marked the place of his burial. 1 Bioj. Brit. Funeral Sermon, by Ashe. Clark’s Lives at the <nd of his Martyrolefy.